Environmental issues have become more and more important in our lives, and therefore meteorology is getting more attention and raising more social interest. Due to climate change, the number of severe and hazardous weather events has increased in Hungary. For example, 12 years ago during the closing firework display for the Hungarian National Holiday in Budapest, the final firework was swept away by a supercell which caused panic among the celebrating crowd. Due to the damage caused by severe weather events, the need for a better understanding and more accurate predictions has increased. Besides this, teaching experiences show that environmental topics highly motivate students to learn physics. Lots of meteorological topics such as precipitation formation, the genesis and the properties of the cyclones and anticyclones etc. have come into the new NAT (National Curriculum) for elementary and secondary school teaching. However, in Hungary, environmental science has never been a part of school education as an independent subject. Environmental science was previously built into the geography curriculum and nowadays it is covered mainly in physics courses. This change is a consequence of the need for more exact explanations of topics which can be given by using the basic laws of physics. It is obvious that the basis for good effective teaching is proper teacher training. However, in the case of environmental science a good way of enhancing the environmental literacy of students and adults is by informal teaching in science centres for example. Continuous changes to the curriculum have led to teachers and education researchers searching for proper methods of teaching the difficult topics of environmental physics and meteorology at secondary school level. There are some unavoidable themes in atmospheric physics which cause big problems for secondary school students (e.g. the Coriolis-force and the concept of momentum). For these topics new educational research methods such as MER (Modelling Education Reproduction) and DBR (Design Based Research) are extensively used. In this short article we aim to illustrate how environmental topics have been embedded in the physics teacher training programmes of Eötvös Loránd University and also show developments in the field of the informal teaching. As well as this we will give an account of educational research connected to these topics. The GLOBE (Global Learning and Observations to Benefit the Environment) programme was launched 1994 in the USA with the goal of promoting the teaching and learning of science, in line with the Rio de Janeiro Earth Summit. It aims to give students worldwide an opportunity to participate in data collection and the scientific process involved in it in to order to better understand, sustain and improve the Earth’s environment. In the framework of an environmental observational system, students make measurements and observations in the fields of meteorology, water chemistry, botany and zoology. Hungary joined the GLOBE program in 1999 and at present 30 secondary schools participate in it. One of the GLOBE events held in Hungary was related to practicing the use of the sun photometer. Some details can be found in GLOBE’s Stars and STEM stories. As a consequence of the GLOBE programme, many students have specialised in science. Our central goal is therefore to integrate the GLOBE programme more deeply into secondary level education. To support this, a one-semester optional course is offered to B.Sc. and M.Sc. students studying earth and environmental sciences and to future teachers of science subjects. Besides environmental measurements, the course emphasises the societal elements of sustainable development. An overview of the history of the predictions on the future of mankind and the earth is also provided, starting with Malthus, through the reports of the Club of Rome, up to the recent UNESCO report “Shaping the Future We Want”. The Physics Education Ph.D. Programme in the Graduate School for Physics at the Eötvös Loránd University began in 2007. This programme created the opportunity for in-service physics teachers to obtain a Ph.D. degree in novel, interesting and inspirational ways of teaching physics or in some environmental phenomena on which they carry out novel research. The first two years of the Ph.D. are mainly focused on lectures; the programme is tailored to suit the needs of active, in-service physics teachers. The lectures consist of four modules – each module is taught during one semester. The modules introduce different physics topics, such as astronomy, modern physics, chaos dynamics, cross-curricular aspects of physics and chemistry or biology, and the physics of environmental flows, etc. In parallel with the lectures, participants carry out some research in their own schools. This activity begins in the first semester of their Ph.D. training – they can choose a research topic either from the list created by the staff of the Graduate School or use one of their own suggestions. Since the spring of 2015 an accredited teacher professional development (TPD) course is also provided by the Physics Education Ph.D. Programme at Eötvös Loránd University. Participants can choose from the regular modules of the Ph.D. Programme. It is worth mentioning that the course on environmental flows is extremely popular. Participants of the TPD course are often looking for new ways of teaching, using the SSIBL framework (the Socio-Scientific Inquiry-Based Learning, developed by the PARRISE project) and its methods. In the Hungarian model of SSIBL environmental science has played a central role, since sustainability, questions about renewable energies and other environmental issues are highly emphasised in the development of the social responsibilities of teachers. 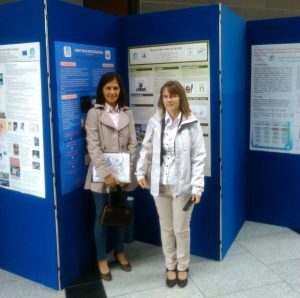 Two participants of our TPD course, both in-service physics teachers in a high school, were invited to participate at the PARRISE Final Conference in Dublin in August 2017. The von Kármán Laboratory for Environmental Flows at the Eötvös Loránd University (ELTE) is one of the very few of its kind in Europe. Based on the principles of hydrodynamic similarity, large-scale atmospheric and oceanic phenomena (shallow-water waves, tsunamis, weather fronts, atmospheric convection, cyclones, tornados, etc.) 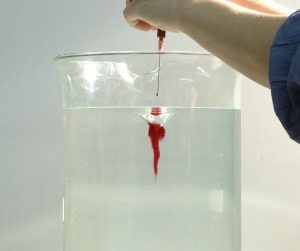 can be accurately modelled and demonstrated here in relatively simple, aquarium-sized experimental setups. The von Kármán Lab is a research lab, but is open for guided tours for visiting groups of high school students one day per week (preferably Fridays) at any pre-agreed time. They have previously organised Lab tours for the general public on Researchers’ Nights and other special events at the University. 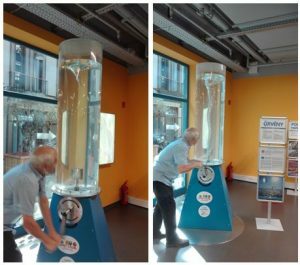 We can see similar experiments in science centers also, where interested visitors can perform the experiments themselves using the exhibited tools (e.g. 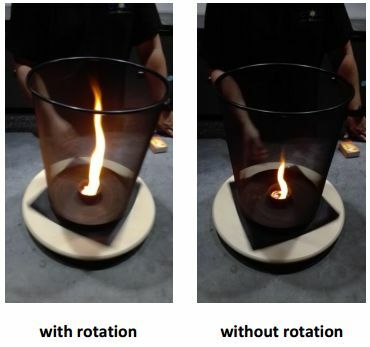 generating a whirl) or at science shows where demonstrators carry out experiments on interesting phenomena like a fire whirl, which has a dynamic structure similar to that of the whirl of water. The Center of Scientific Wonders in Budapest opened its gates 22 years ago as the first science center in Eastern Europe. The center offers a full-day programme with more than 250 games and tools demonstrating various physical, chemical and biological phenomena, fascinating lectures and experimental demonstrations, spectacular multi-D circle cinema movies and others. Meteorology-related interactive games and science shows have been present in the scientific-educational programme of the institute since its opening. The centre also has some programmes for teachers and science educators which show how science centres can help education and arouse the interest of children and students in natural sciences and engineering. Some months ago the centre started a joint venture with experts from the Hungarian Meteorological Service (OMSZ) which involves monthly live streamed lectures and talks. Our lecture series called “From Atoms to Stars” started in 2005, the World Year of Physics, an initiative by the UN, and consists of about 13-15 lectures in a year. This public lecture series aims to educate secondary school students, their teachers and other interested audience members about current and classical physics. The course is also an accredited Teacher Professional Development course. The aim of the lecture series is to help people to understand the scientific background of crucial and important issues which arise in society, such as the utilisation of nuclear energy and its social impact, climate change, new instruments and imaging methods in medical science, game theory in social studies, etc. Video recordings of each talk since the lecture series began, the lecture presentation slides and other related documents are published on the “From Atoms to Stars” website. Since 2010 the talks are also broadcast live on the web; recent talks can be found on Youtube and on the widely known Hungarian videoportal, Videotorium, used for sharing scientific content. The “From Atoms to Stars” lecture series deals with topics such as Physics in meteorology: fronts, cyclones, how the swirling movement is created in thunderstorms, how a physicist can participate in aerosol-related research in Antarctica, how to demonstrate ocean flows and tornadoes in the lab, facts, misconceptions, and questions related to climate change. In August 2015 an international conference was organised at Eötvös Loránd University (ELTE) in Budapest, called “Teaching Physics Innovatively” (TPI-15), which focused on how to teach physics in an innovative way in secondary education. The conference covered a wide variety of themes such as: Inquiry-based science education, Science centres and other informal learning opportunities, Environmental issues or Our cosmic environment. A round table discussion about socially sensitive issues in physics education also took place at the conference. Among the environment-related contributions you can find papers on: light pollution measurements for secondary school as project work, the investigation of energy consumption at a Budapest high school, and the experimental examination of photocells and photosynthesis. One can access the individual papers and presentations on the PARRISE webpage of the ELTE team. One year later, with support from the Hungarian Academy of Sciences, the final version of the conference proceedings was printed, and is now available for interested physics teachers. As part of the PARRISE project we started to address the topic of light pollution. Teaching material has been developed for formal and informal teaching of light pollution at secondary schools. Unfortunately, this teaching material is currently available only in Hungarian, but a short paper was published in English in the Proceedings of the aforementioned TPI-15 conference about an educational implementation of this topic. Since then a webpage has been developed, where students and interested observers can upload photos of their light pollution observations via an interactive interface to the University’s server. In the autumn of 2016 – based on the Physics Education Ph.D. Programme at the Graduate School for Physics of ELTE – an MTA-ELTE research group was formed involving university and high school physics teachers. The research group has a network structure and consists of several subgroups (teams or working groups) which specialise in different tasks or topics, such as environmental physics or informal education. Each of the school teachers in the group pursue their research voluntarily as extra work in their school and maintain communication with other members of their team. One of the special activities of the research group was to build a mini meteorological station with the students. The first mini meteorological station, containing different sensors that determine the characteristics of the atmosphere, is fixed on the top of a gym and records temperature, pressure, humidity, gas composition and UV index data. The collected data are processed and analysed on a regular basis and used for various lesson topics in biology, geography and chemistry classes. This project was planned to be part of a network of mini meteorological stations. Students from other schools can get involved in the measurements using similar self-made devices and can upload their measurement data to the webpage. We can use these data to create a weather map for schools. For more information see http://scilwg.elte.hu/. This study was funded by the Content Pedagogy Research Programme of the Hungarian Academy of Sciences.